European breads are made with flours that are much softer than their North American cousins, and authentic Euro-style artisan breads are built on flours with protein content in the 10% to 11% range - similar to U.S. all-purpose flour. The New York Bakers offers a range of patent flours suited to artisan bread baking, from authentic imported Italian Tipo 00 pizza flour and rinforzato (reinforced) flour for Italian breads, to our own artisan flour and those produced by other millers. 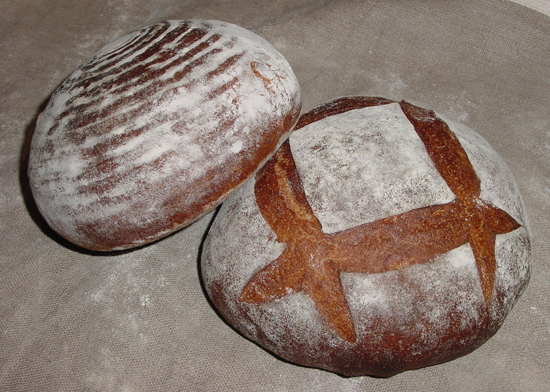 Home bakers interested in exploring the world of artisanal hearth bread will find what they're looking for right here. You can find our recipe for Vera Pizza Napoletana dough right here, and our recipe for European-style hearth bread dough here. Enjoy! Approximate analysis (14% moisture): Protein 10.95%, Ash 0.61% A proprietary blend of premium patent and straight wheat flours, with finely milled bran added to parallel the appearance and performance of French Type 55 flour for the classic French hearth bread shapes and textures. 5 lb./2.27 kg. poly bag. Approximate analysis (14% moisture): Protein 12.14%, Ash 0.68% Our own blend of moderate-strength European-style artisan flour, with just a touch of rye added for the hearty, complex flavors of European country loaves. 5 lb./2.27 kg. poly bag. Approximate analysis (14% moisture): Protein 11.3%, Ash 0.52% Made from the highest baking quality hard red winter wheat, this is an extremely extensible, premium patent flour designed for artisan baking. 5 lb./2.27 kg. poly bag. Find the right flour for your artisan-style hearth breads. Five pounds each of: NYB Euro-Style Artisan Flour, Giusto's Unbleached Artisan Flour, NYB Farine de Campagne, and NYB Farine Rustique. Our assortment of imported and Euro-style flours. Five pounds each of: Imported Caputo Tipo 00 EXTRA AP Flour, Caputo Tipo 00 Rinforzato Bread Flour, Caputo Tipo 00 Pizzeria Flour, and NYB Euro-Style Artisan Flour.